As one could expect from Google, the new browser has fewer buttons then it's older siblings - Mozilla Firefox and Apple Safari (on which Chrome is partly based) - it's the everlasting Google's Keep It Simple strategy. The first thing that drew my attention, was the full GUI integration with Aero, which looks pretty good. 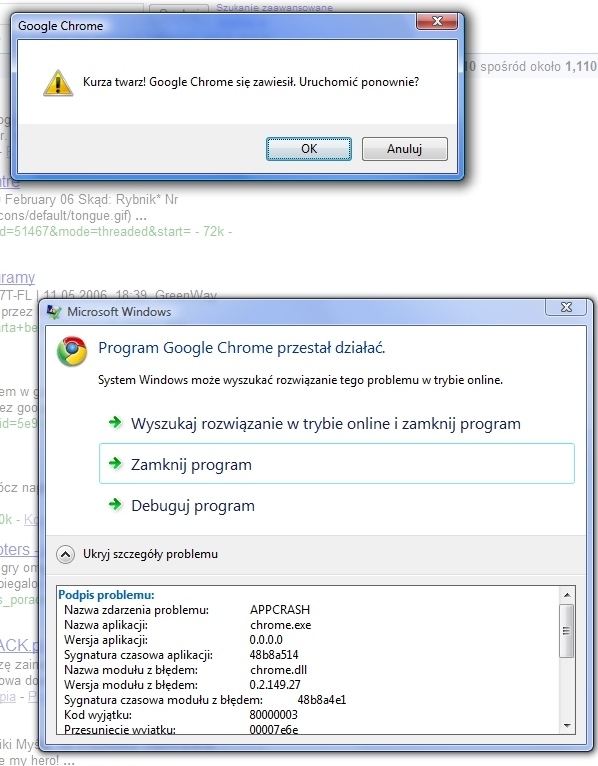 The second thing was the number of processes called "chrome.exe" in the taskmgr - each website has it's own process, plus there is another one for the GUI. In my opionion, this is a rather good idea - it decreases the probability of Chrome getting blown up by one single stupid site. Back to the GUI, I was pleasantly surprised with how smoothly and fast it worked - I have a decent PC, but Firefox was never so smooth as Chrome is.. yet another advantage of the process separation (but not only process separation of course). 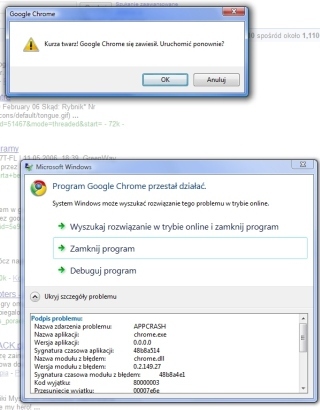 The second test, after looking around in Chrome for a while, consisted of throwing some internal address into iframe - in my case it was the view-source:http://gynvael.coldwind.pl. Nothing showed up in the iframe, as expected. So I've checked the Inspector (RMB, Inspect Element - it's something like Firebug), and nothing showed up here either, but to my surprise, when I clicked ALT+LPM on the link in the inspector (it suggested me to do it itself), the Chrome came down with a full scale crash - all the processes stopped working, and additionally a funny error message came up (unfortunately, the screenshot on the right is in Polish; the error message is something like "Oh my gosh! Google Chrome crashed! Run again?"). Well, I guess this path the devs didn't check, and I think it can say something about the stability. However to be honest I must say that during normal work Chrome hasn't crashed even once. Continuing with the tests, I tried running Chrome within the context of a different user (runas.exe /user:chromeuser) and see if that whole multiprocess thing won't go bananas (of course the chromeuser had Chrome installed independently - it is required due to the Chrome strange installation path; btw, how come Google revokes me of the right to choose where apps are installed on my PC?). However, I couldn't check the if it went bananas, because Chrome wouldn't show anything (any page) except the GUI, even about:version (I'll add that Firefox didn't have any problems running on that user). about:stats - some more statistics with a funny message "Shhh! This page is secret!" But there is no about:config. Well all in all there aren't to many configuration options. And I can't say I like that Chrome uses Windows proxy settings. I would prefer it to have it's own setting, just like Firefox has - the lack of these settings make using Socks4 harder (and socks4 is the standard dynamic SSH tunnel). Hmm, and I couldn't find the option to save the current page. A good thing is that there is an option to print the current page. Update: OK nvm, deus showed me where it is (RMB, Save as...). Update: I've just saw on the FD list that Rishi Narang aka psy.echo discovered how to crash Chrome without user interaction. Of course this started an argument on FD whether vulns in Beta apps should be reported (please note that everything is beta in Google), but regardless of this, I think that that bug is just interesting.